Thomas Mountain stands at 5,269′ just north of Easton, WA, sandwiched between Lake Kachess and Lake Cle Elum. This challenging 6 point summit overlooks Kachess ridge to the west and Easton ridge to the south. 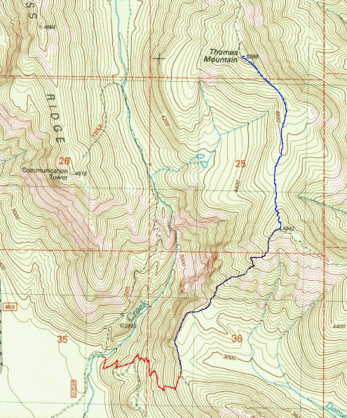 The summit is only about four miles from the trail head, but don’t let that short distance fool you. The trip packs in a couple of steep trail ascents that each have you climbing over 1,000 feet per mile, and has an overall elevation gain of 3,400′ for the round trip. Most of the trip is on well maintained trials, but the spur that heads to Thomas Mountain can be difficult to find and is moderately overgrown with plenty of blowdowns to navigate across. The final ascent is relatively easy. The wooded summit is roomy with excellent prospects for wire antennas. The views, particularly to the east, are probably outstanding, but we were in the clouds for this activation. My friend Chris and I wanted to escape a rare rainy August day in the Puget Sound region. The weather for Easton called for a chance of rain, but accumulation was in the 100th of inches. Chris and I had tried to activate Thomas Mountain in late June, but a dumb navigational error on my part led us up Easton Ridge instead. Once we realized the error, we continued up to activate the Easton Ridge summit (W7W/CW-077). For this trip, we were determined to get it right. The trail head is a couple of miles just off I-90 in Easton, and is easy to find, provided you don’t use a USGS topo map or Google maps, which don’t show the dirt road to the trailhead. Bing, Mapquest and Open Street Maps do show the proper road. Also, ignore instructions that have you following the power line road. That route has been blocked to motor vehicle traffic. Take exit 70 (Easton) off of I-90 and turn NE (left from Seattle, right from E. WA). At the T-intersection, turn left onto Sparks Rd. In 0.6 miles, turn right on to Kachess Damn Rd. In 0.4 miles, you will cross under the power lines. Continue straight for another half mile, and turn right onto the dirt road. The road is in reasonably good shape and takes you to the trail head in under 0.5 miles. There is no indication that a permit is needed, but hanging a NW Forest pass couldn’t hurt. There are two trails at the trail head. The Kachess trail is well marked and off to the left. Don’t take that. Instead take an unmarked (Easton) trail straight ahead. It descends a bit, and you will hear a waterfall and soon cross over Silver Creek on a sturdy wooden bridge. Calm your mind, gather your energy, and find your inner strength as you are about to ascend a series of about 10 switchbacks that, according to Summitpost, provide “1100′ elevation gain in roughly 0.8 miles.” This leg is in red on the map below (click for larger image). When the switchbacks end, a sign offers you the choice of Easton Ridge trail to the right and the Domerie Divide Trail to the left. Take the Domerie Divide Trail. Open Street Maps only shows the Easton Ridge trail from this point, so use the classic USGS topo map for the rest of the route. The Domerie Divide Trail is relatively flat for about 1/2 mile and has a terrific viewpoint looking over over Lake Kachess along the way (This leg is black on the map). At about 3,700′ the trail ascends steeply, and largely without switchbacks, to point 4942, a rise of 1,242′ in a bit over a mile. Here the main trail continues to Mt. Baldy and Domerie Peak, which are fine destinations, I’m sure, but aren’t SOTA summits. Instead, hunt for a trail off to the left, behind a downed tree and hidden by lack of use or maintenance. The trail descends steeply about 300′ to the saddle between point 4942 and Thomas Mountain (leg is blue on the map). It is not well maintained, but easy to follow pushing through knee- to waist-high vegetation and numerous blowdowns. From the saddle you will ascend about 600′ to the summit. Chris and I took about 3 hours from the trailhead to the summit. We had light sprinkles that barely moistened the trail on the way up. Winds were howling over the saddle and the west face of the summit. Fortunately, there was a rock outcrop on the east side of the summit that acted as a windbreak for radio operations. The radios stayed dry for the first few minutes, anyway. We arrived right at the 4pm PDT activation time, and I quickly set up a 4 element yagi for 2m. Mike, KD7TS, responded to my CQ on 144.2 MHz SSB, followed by Tom, KE7SW. The drizzle was starting to turn into rain. Tom called his brother Bob, N7QOZ, who was on the air a minute later. That made three contacts all from the south Puget Sound area. Next I heard a weak SSB signal that peaked up toward the South. It was Greg, K7YDL, calling from Portland, Oregon. The signal was clearly multipathing and Greg pointed out that we had Mount Rainier and Mount St. Helens directly in our path. With four QSOs in the logbook, Tom and I made a brief unsuccessful attempt on 1296 MHz, but the rain was picked up even more. I went QRT without so much as a CQ on 2m FM. Unfortunately HF was out of the question. The trip back was a little unpleasant. Rain jackets kept us dry from the rain, but the overgrowth in that final saddle was wet and soaked our pants thoroughly. Crawling under and over blowdowns was messier. The hardest part, however, was the steep descents from point 4942 that tortured our quads and pounded our joints. The return trip, perhaps hastened by rain, took a little over 90 minutes. We must of had fun, however, because on our way to the Issaquah Brew House for a celebration dinner, we decided to do it again next year…in better weather.